AMD has unleashed the first product based on its highly anticipated “Vega” graphics processing unit (GPU) architecture: Radeon™ Vega Frontier Edition. 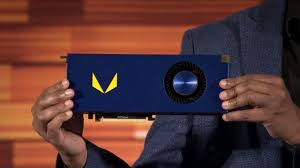 Radeon Vega Frontier Edition is the world’s first graphics card designed to empower the next generation of data scientists, game designers and visualization professionals, with up to 172 percent faster rendering performance than the comparable competitor card, Through its disruptive High Bandwidth Cache Controller, the cornerstone of the world’s most advanced GPU memory architecture – HBM2 – Radeon Vega Frontier Edition expands the capacity of traditional GPU memory to 256TB, allowing users to tackle massive datasets with ease, and scored up to 33 percent faster than the competition in the DeepBench benchmark that measures the performance of basic operations involved in training deep neural networks. Together with AMD’s open-source, fully scalable ROCm software platform, Radeon Vega Frontier Edition paves the way for pioneers to continue pushing boundaries in fields like artificial intelligence (AI). Developers can now use the power of the “Vega” architecture for machine learning algorithm development on the Radeon Vega Frontier Edition faster than with any other GPU on the market, before deploying it out to massive servers equipped with Radeon Instinct accelerators. This powerful new solution also delivers a disruptive performance per dollar equation, solidifying AMD’s leadership in compute total cost of ownership (TCO). Radeon Vega Frontier Edition delivers the horsepower required for design and manufacturing firms to drive increasingly large and complex models and to deploy real-time visualization and physically-based rendering. The Radeon Vega Frontier Edition’s revolutionary memory engine also allows professionals to achieve photorealistic detail in computer-generated imagery. A visualization powerhouse, the Radeon Vega Frontier Edition GPU offers exceptional multi-GPU scaling, with 91 percent faster rendering using two Radeon Vega Frontier Edition GPUs. The Radeon Vega Frontier Edition graphics card simplifies and accelerates game creation by providing a single GPU that is optimized for every stage of a game developer’s workflow. This includes everything from asset production to playtesting and performance optimization. With the Radeon Pro Settings user interface, users can seamlessly switch between “Radeon Pro Mode” and “Gaming Mode” to alternate between development on animation applications like Autodesk Maya and performance optimizations with free, open source tools available through AMD’s GPUOpen initiative. The compute power in Radeon Vega Frontier Edition and its support for an open software ecosystem also give a new breed of developers and filmmakers the ability to break new ground in virtual reality (VR) and 360-degree video content. AMD’s fastest Radeon VR Ready Creator graphics card ever, Radeon Vega Frontier Edition achieves the maximum possible score in the SteamVR benchmark, up to 21 percent higher than the multi-GPU Radeon Pro Duo solution. Combined with Radeon Loom, AMD’s revolutionary 360-degree video stitching technology, creators can stitch high-resolution video in real time.